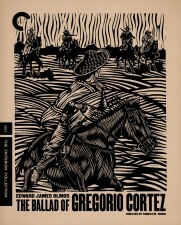 The new Criterion Collection entries in their August 2018 newsletter include Edward James Olmos' The Ballad of Gregoria Cortez, and the site also has an interview with Chloe Zhao talking about Terrence Malick's The New World, and Jeremiah Zagar, the director of the exciting new film We the Animals, listing his top ten favorite Criterion disks. Thanks Chris. I think it's very likely I didn't see "The Ballad of Gregorio Cortez". I don't know about you but I cannot remember whether I watchED a movie in full or a trailer or only a part of the movie (perhaps because I watched it on TV and perhaps it had already started when I caught it, or because the TV broadcast version is shorter than the original cut. I look forward to it in this restored version. As far as Malick is concerned, I am among those who embrace his use of characteristic swirling camera movements while the character's stream-of-consciousness is presented via voice-over. These are Malick's philosophical investigations (some mat call them ruminations). I have see different versions of THE NEW WORLD several times; love it. So I will check out this interview promptly. I rewatched Jarecki's impassioned THE KING. A top 10 film of 2018 for me along with Jim McKay's EN EL SEPTIMO DIA and Martel's ZAMA. I watched Alex Garland's ANNIHILATION and I liked the trippy visuals and the performances by Jennifer Jason Leigh and Natalie Portman but its dramaturgy falters and yields a film that constitutes a lesser achievement than the director's own EX MACHINA and recent Sci-Fi films by Cuaron and Villeneuve. I re-watched Alfred Hitchcock's THE PARADINE CASE. It's very upsetting when you know enough to recognize precisely how David O. Selznick is getting in the way of a potential masterpiece and forces Hitchcock to make compromises for the sake of convention and the bottom line. Like SUSPICION AND REBECCA, It's not a bad film, of course, but it's not prime Hitchcock like other films he made in the 40s such as NOTORIOUS and STRANGERS ON THE TRAIN. I continue to think that Alexander Payne's DOWNSIZING is very interesting and rewarding film. Plan to rewatch. The remake of the Argentinian film "Rompecabezas" titled PUZZLE is solid and a pleasant experience to many, as I noticed from the showings in my theater.I don't have strong opinions about it, to be honest. Thanks for your views and report. I haven't seen Gregorio Cortez, or En el septimo dia, or Annihilation. Why are we talking about Terrence Malick? I loved The New World too, and Tree of Life, but lately with To the Wonder and Knight of Cups he has struck out, to the point of self-parody, and I've lost faith. Of course we like the mobile camera like Emmanuel Lubezki's for Cuaron, but we also like the Asian-style static one (Hou Hsiau Hsien). Depends on the individual use of it and its appropriateness to the film. My Filmleaf review of The King will show as I think I said to you directly before, I sort of found it to be overambitious and overstuffed, though an impressive effort. An editing issue. There's material for a good film there, even if an editorializing, poetic one, rather than an informational one. I like docs that present hard fact like Dark Money or new intimate information that's factual but moving like To Be and To Have and My Architect. I've seen many of Hitchcock's movies but not The Paradine Case. It sounds like a good display of Hitchcockian technique. Strangers on a Train isn't a Forties film but 1951. Puzzle (my review) ends up being a watchable but blah, "meh" piece of work; I heard the original is great but didn't get to see it, so far. Irfan Khan is very cool but not Kelly Macdonald. I still think Downsizing (I repeat) is a meandering, "meh" disappointment, again see my review. I'm pretty good at remembering movies I've seen, but not every single one. Have you seen Sorry to Bother You, Blindspotting and BlacKKKlansman? If not, drop everything and go see them. Last edited by Chris Knipp; 09-04-2018 at 01:16 PM. Hard to believe; but I appreciate the compliment. The Neighboring Sounds FSLC Latin series is new and will need some time to get up to the level of the amazing NYAFF, which I've covered for two years, but has been in existence (not always at Lincoln Center but there now) for seventeen. They had over 50 films and I had access to most of them though I couldn't watch that many! But Latin American doesn't have film industries as well funded as those of China, Hong Kong, Japan, and South Korea I'm guessing, so that is an issue too. I have never seen Helzapoppin'. I am trying to selectively review the oeuvre of Woody Allen now. So far I've watched Match Point, Annie Hall, Manhattan, and Bananas. So entertaining and original. I'm not accredited for the NYFF anymore, but I still am going and hope to see as many as I can of the Main Slate. How come you're not accredited? Tell me about this process, if you don't mind. I haven't covered a film festival in about 5 or 6 years. Do festivals still have screenings and screeners? Isn't it all about getting a special code from the publicist so you can download or stream the films they are showing? The last Woody Allen film I liked may be HUSBANDS AND WIVES, almost 20 years ago. I know Match was good too but it's not a film I'm inclined to re-watch. I like Allen's films of the 70s and 80s less than I used to. No, it's not online screeners. It's separate press screenings of all the Main Slate NYFF films (plus a few extras) shown in sequence, starting always in the morning, mostly at the same location, starting a week or two earlier than the public ones. Why am I not accredited now? You tell me. A lot of people have been eliminated over a period of five or so years. I could talk a lot about Woody Allen but I'll save that till later. After all, he's done over fifty films. For now, my description, 'so entertaining and original,' will do. Let me correct what I said: not to see 'as many as I can of the Main Slate,' but just to see most of the ones that look interesting to me, without knocking myself out. Last edited by Chris Knipp; 09-06-2018 at 11:41 PM. More about the NYFF Special Events, and Film Comment Selects for the Festival. Rex Ingram’s adaptation of the famous novel by Vicente Blasco Ibáñez gave us one of cinema’s greatest antiwar films and catapulted actor Rudolph Valentino into history as one of the first screen idols. The Four Horsemen of the Apocalypse is a devastating epic centered around a divided Argentine family fighting on opposite sides during World War I. Famously remembered for the cool, sensual, and powerful tango sequence lead by Valentino, the film endures for Ingram’s meticulous attention to mise en scène—beautiful and macabre compositions alike—and the nuanced performances from a cast including Alice Terry and Josef Swickard. The Film Society is pleased to present the North American premiere of a live score written and performed by Matthew Nolan (electric guitar/electronics), Seán Mac Erlaine (reeds/electronics/vocal), Adrian Crowley (Mellotron/vocal), Kevin Murphy (cello/vocal), and Barry Adamson (bass guitar/percussion/synths/vocal). The score was commissioned by and premiered at the St. Patrick’s Festival Dublin in March 2018. Supported by Culture Ireland. Special 35mm print courtesy of Martin Scorsese from the M.S. Collection at the George Eastman Museum. Cinema lovers around the world have been waiting to see this legendary movie for more than 40 years. Orson Welles started shooting in 1970 with a precarious funding scheme, an ever-mutating script, and the lead role of Jake Hannaford, an old-guard macho Hollywood director at the end of his tether, yet to be cast. When he died fifteen years later, the film was not only unfinished but in legal limbo. 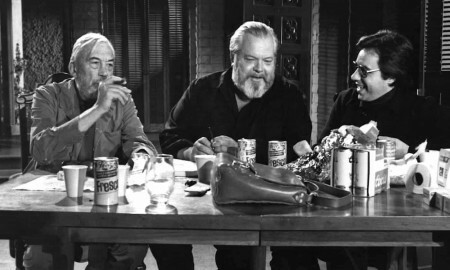 Almost 50 years after Welles started shooting, The Other Side of the Wind has finally been completed by Welles’s collaborators, including producers Frank Marshall and Filip Jan Rymsza. The film features a collection of actors as eclectic as the cast of Touch of Evil, including John Huston as Hannaford, Peter Bogdanovich, Oja Kodar, Edmund O’Brien, Susan Strasberg, Lilli Palmer, Paul Stewart, Mercedes McCambridge, Cameron Mitchell, Paul Mazursky, Henry Jaglom, Claude Chabrol, and, in a movie-stealing performance as Hannaford’s right-hand man, Welles’s old collaborator Norman Foster. A Netflix release. The story of the making of The Other Side of the Wind is as engrossing and rich in character and incident, and perhaps even more epic in scale, than the film itself. 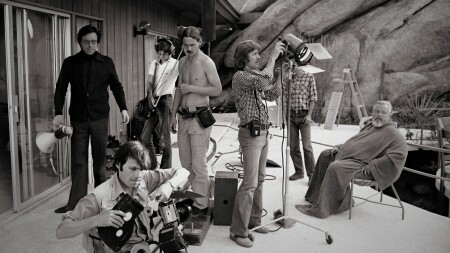 Morgan Neville’s documentary complements and deepens the experience of Welles’s film by placing it within the context of his life and career, setting the scene and the particular mood of Hollywood in the early 1970s, and chronicling every last creative, legal, financial, and behavioral twist and turn on the circuitous road from the first set-up to the first official screening almost 50 years later. The title, of course, comes from none other than Welles himself. A Netflix release. Behind the scenes of The Other Side of the Wind. Scandinavian mythology makes for a visceral fantastical drama on the mystery of identity in this adaptation of a story by Let the Right One In writer John Ajvide Lindqvist. Ali Abbasi’s twisty Cannes award-winner (Un Certain Regard, 2018) centers on a customs inspector, Tina, who possesses the ability to sniff out contraband and moral corruption. Her findings lead her into a criminal investigation, but the heart of Border lies with Tina, who tires of her deadbeat boyfriend and experiences a full-bodied awakening like little else seen on screen. Grounding it all is Eva Melander’s outstanding, minutely sensitive performance, the true north for Abbasi’s genre-driven momentum. A NEON release. The gorgeous backdrop of rolling country and idyllic farmland are cold comfort to the frustrated hero of The Wild Pear Tree. Turkish auteur Nuri Bilge Ceylan (Once Upon a Time in Anatolia) captures the wrenching struggles of a bright literary graduate, Sinan (Aydın Doğu Demirko), who is trying to take flight in a world he can’t entirely accept. Ceylan revives a deeply humanist cinema of ideas in tracking Sinan’s path through the more urgent questions of youth, romance, religious orthodoxy, and shaking off the burdens of your family—without ennobling the all-too-human Sinan. Often shooting in unbroken takes, Ceylan compellingly “renders the frustrations of this young man as so much misplaced passion” (Kent Jones, Film Comment). A Cinema Guild release. Last edited by Chris Knipp; 09-11-2018 at 08:36 PM. NYFF 2018 Festival Coverage thread. 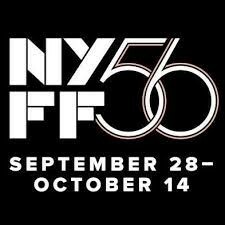 This NYFF 2018 (56) Festival Coverage thread is getting set up now, with titles and images and intros to the films I'm pretty sure to be seeing. Check it out here: CLICK. Last edited by Chris Knipp; 09-11-2018 at 08:39 PM. 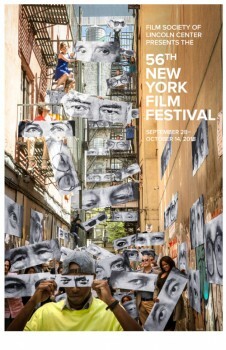 The FSLC poster for NYFF 56. Last edited by Chris Knipp; 09-24-2018 at 09:13 PM. About the poster. 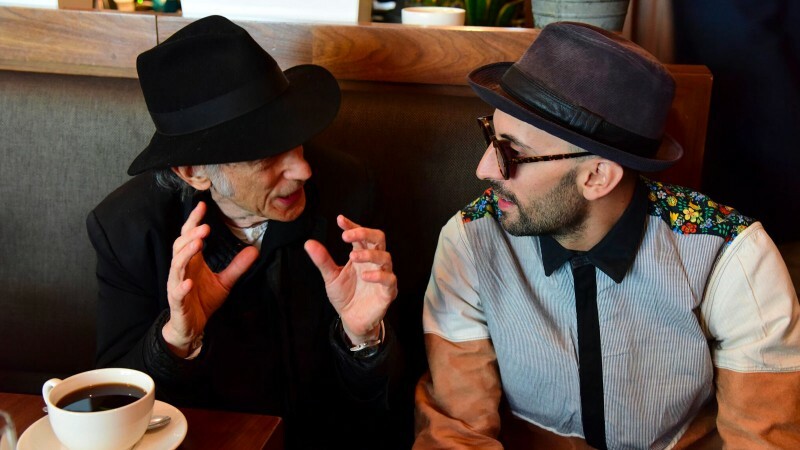 It resulted from a spontaneous collaboration between the cinematographer Ed Lachman (left), a regular at Film Society of Lincoln Center screenings (when he is not working), and JR (right), the community-participation French photographer who made Faces, Places with Agnès Varda recently. On the partnership and thought process behind this year’s poster, Ed Lachman explains, "Being at the Festival is the highlight of the year for me, when I’m not working. It’s a place to meet, share, and experience what cinema can be. 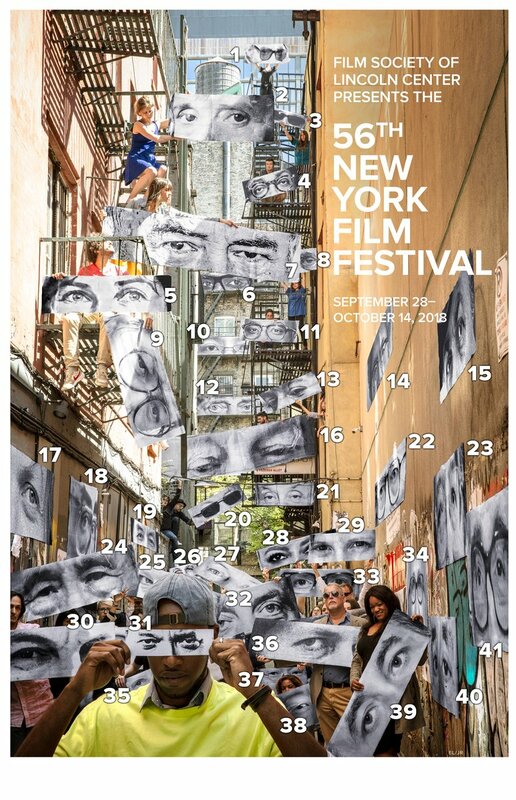 The opportunity to create the poster for the New York Film Festival and collaborate with JR was a formidable experience and similar to filmmaking, where one works with other visual artists to create a project. I’ve had the greatest respect and admiration for his work over the years, both visually and how he engages communities he’s portraying within a social context, which I think is so important in today’s world, to find how we're all connected, rather than separated and divided." According to Lachman, "The idea came together using JR’s emblematic eyes . . . What is cinema without the mind, the heart, and the eyes of the filmmakers? Using the director’s eyes can symbolize the creative force behind the images and the stories that the Festival has championed and represented to New York over the years, supported by the audience holding the placards of their eyes, and what can be more New York than our alleyways?" A revered and award-winning cinematographer, Ed Lachman has shot more than 100 narrative, experimental, and documentary titles in the United States and internationally. He is known for his collaborations with Todd Haynes, Steven Soderbergh, Robert Altman, Paul Schrader, Todd Solondz, Sofia Coppola, Werner Herzog, Wim Wenders, Volker Schlöndorff, Ulrich Seidl, and Jean Luc-Godard, among others [including Larry Clark]. Lachman’s work has garnered him numerous honors including Academy Award nominations for his work on Carol (2015) and Far from Heaven (2002), as well as an Emmy nomination for the HBO miniseries Mildred Pierce (2011). He has been honored with the American Society of Cinematographers Lifetime Achievement Award, Telluride Medallion Award, Gotham Award, and this year at Cannes with the 2018 Angenieux ExcelLens in Cinematography Award. Lachman is also known as a visual artist who has had installations, videos, and photography at the Whitney Museum of American Art, MoMA, the Ludwig Museum in Germany, and many other museums and galleries throughout the world. JR exhibits freely in the streets of the world, catching the attention of people who are not typical museum visitors. In 2006, he created Portrait of a Generation, images of suburban "thugs" that he posted in huge formats in the bourgeois districts of Paris. In 2007, with Marco, he made Face 2 Face, large portraits of Israelis and Palestinians standing facing each other in eight Palestinian and Israeli Cities, considered the biggest illegal exhibition ever. In 2011, he received the TED Prize. Later that same year, he created Inside Out, a global participatory art project that transforms messages of personal identity into works of art. As of September 2017, over 350,000 people from more than 140 countries have participated, through mail or gigantic photo booths. His recent projects include a collaboration with New York City Ballet; the feature documentary Faces Places, co-directed with Nouvelle Vague legend Agnès Varda; seemingly “erasing” the pyramid outside of the Louvre; giant scaffolding installations at the 2016 Rio Olympics; an exhibition on the abandoned hospital of Ellis Island; and a gigantic installation at the U.S.-Mexico border fence. As he remains anonymous and doesn’t explain his enlarged full-frame portraits, JR leaves the space empty for an encounter between the subject/protagonist and the passerby/interpreter. A special thank you to photographers David Godlis and Julie Cunnah for their photo contributions to the poster. Chantal Akerman photo courtesy of Kenneth Saunders/The Guardian. These limited-edition posters will be available for purchase during the festival at filmlinc.org/merch. NYFF will also be holding a contest: the person who correctly identifies the most director eyes will receive a pair of festival tickets and a signed poster. See a poster key here and enter the contest here. Ed Lachman will speak to NYFF audiences about the poster concept and creative process at a free NYFF Live talk during the festival, details to be announced. - FSLC press release. In a coming of age epic Honoré for the first time (in his eleventh feature) directly confronts his own experience of being French and gay in the age of AIDS. Three characters, who interact, stand in for him as a young man in Brittany who eventually movies to Paris (Vincent Lacoste), a somewhat successful writer he falls in love with who has AIDS (Pierre Deladonchamps) and an older man who must be content with prostitutes (Denis Podalydès). At times harsh, poetic, or funny, Sorry Angel is a brave and accomplished film, and a lot to take in at one sitting. A new press release about a surprise NYFF screening: Jonah Hill's directorial debut feature. New York, NY (October 1, 2018) – The Film Society of Lincoln Center reveals the NYFF secret screening as Jonah Hill’s Mid90s, making its New York premiere at the 56th New York Film Festival (September 28 – October 14). Jonah Hill’s directorial debut is a frank, intimate, and emotionally layered reflection on an unlikely coming-of-age in the world of 90s L.A. skate culture. Thirteen-year-old Stevie (Sunny Suljic), growing up with a loving but largely absent mother (Katherine Waterston) and a resentful brother (Lucas Hedges), seeks refuge with older kids who hang out (and barely work) at a Los Angeles skate shop. The energy between Stevie and his crew, played by Ryder McLaughlin, Olan Prenatt, Gio Galicia, and Na-kel Smith, fuels a film that is at once lyrical, hilarious, terrifying, and just…real. The 17-day New York Film Festival highlights the best in world cinema, featuring works from celebrated filmmakers as well as fresh new talent. The selection committee, chaired by Kent Jones, also includes Dennis Lim, FSLC Director of Programming, and Florence Almozini, FSLC Associate Director of Programming. Last edited by Chris Knipp; 10-01-2018 at 01:19 PM. Click here for thumbnail New York Movie journal revies of five more NYFF Main Slate films: Tamara Jenkins' Private Life,, Olivier Assayas' Non-fiction/Doubles vies, Ying Liang's A Family Tour, Lee Chang-dong's Burning, and Claire Denis' High Life. PRIVATE LIFE (Tamara Jenkins 2018). Eleven years since Jenkins' last film, Savages, this one seems still focused on the narrow aim of (affectionately) satirizing a hip white middle class demographic. Kathryn Kahn and Paul Giamatti play a couple in their forties, literary types living in the Lower East Side, going nuts trying with the help of a fancy fertility clinic to have a baby. Warmly received by the NYFF audience. NON-FICTION/DOUBLES VIES (Olivier Assayas 2018). A witty, fast-paced, smartly edited incarnation of traditional French farce, focused on two criss-crossing couples (and some others), with Juliette Binoche, Guillaume Canet, Vincent Macaigne and Pascal Greggory, and a lot of debating of entertainment, media, and the current cyber world vs. print. The result is both exhilarating and calming. Another feather in the cap of the versatile Olivier Assayas. Things have changed since I watched Ying's mini-budget Taking Father Home with Travis Kirby in 2006 and Travis reviewed it disapprovingly in the Festival Coverage section. The director's subsequent films so angered the repressive Mainland Chinese regime that Ying was forced into exile with his wife and small child in Hong Kong. This film, his first since their exile began sic years ago, depicts with sad precision an experience they had meeting furtively with family members by joining a strict Mainland-run guided tour of Taiwan. Visa problems in Hong Kong prevented him from being present for the small NYFF screening. This was painful and even sometimes boring to watch but also very true and sometimes poetic and delicate, and fans of Chinese cinema need to see Ying's films. Last edited by Chris Knipp; 10-05-2018 at 09:58 AM.